Vocabulary is key for reading comprehension. Multiple encounters of a new word is required before a word is really known. Repeated exposure to a word in a variety of contexts can add dimension to what is known about the word. “The more opportunities students have to think about and use the words they are learning, the more elaborate their mental repesentations of the words will be.” (Bringing Words to Life by Isabel Beck.) Fisher Hill’s English literacy program includes six vocabulary workbooks that provide the necessary practice for learning new words. In each workbook, there are many pictures and graphic organizers to help students remember and understand the new words. Graphic organizers are visual representations or frames used to organize information. Graphic organizers are tools that can be used to visualize and organize information. They can help students see the relationships between ideas; and more easily understand, remember and apply information. 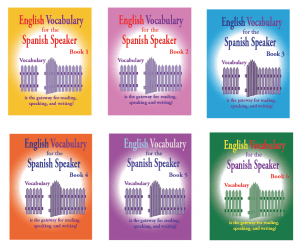 The vocabulary workbooks review the vocabulary for each level. Fisher Hill’s literacy program uses Orton-Gillingham principles. The Orton-Gillingham approach uses structured, explicit, systematic and multi-sensory procedures to teach the skills in their literacy program. As with all Fisher Hill workbooks, the activities and lessons are not overwhelming. The workbooks are explicit, systematic and very structured. 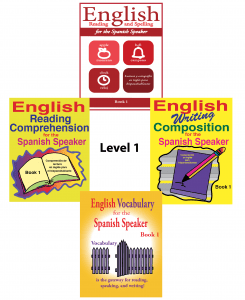 Students like our workbooks because the pace is reasonable, print is large, directions are in Spanish, there are many pictures but the content is for older students and adults. Teachers like our books because everything is ready to go! There’s an answer key at the end of each lesson. The workbooks are geared toward Spanish-speaking teens and adults but students who speak another language can benefit from using these books because the program is to teach English literacy. There is an English translation of the Spanish directions at the end of each book. Visit us on the web at www.Fisher-Hill.com to learn more about our Vocabulary workbooks and our English literacy program.